Skills: Suitable for those who can knit with two colours. Skill Focus: Blending colours, designing yokes, traditional Shetland knitting techniques. 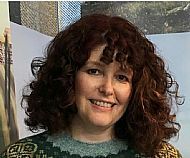 Janette Budge joins us from Shetland where she is a member of the Shetland Guild of Spinners, Knitters, Weavers and Dyers, tutor at Shetland Wool Week, and designed the Clickimin Cowl, for the 2018 Shetland Wool Week Annual. 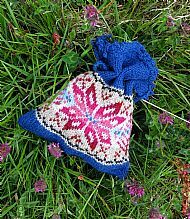 This class will focus on traditional Fair Isle styles with participants following an adapted star and tree pattern to knit a shaped circular yoke bag. Drawing on many traditional skills Janette will be teaching you how to blend colours, adapt designs and share techniques on decreasing within a pattern. Having learnt these skills you will be able to go on to create your own yoke for a circular jumper or cardigan. During the class you will have the chance to use a knitting belt and long DPNs, and learn more about Shetland knitting. Before the class you will need to cast on 88 stitches, on 3 or 3.5mm circular needles or DPNs, using 2ply jumper weight or 4ply yarn, and knit 8 rows circular (do not cast off). The other colours needed for the pattern will be supplied in the class.